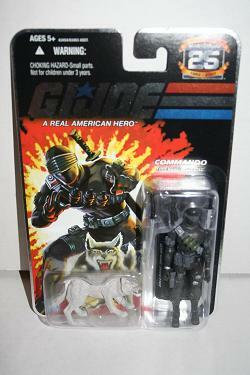 First out of the gate for the GI Joe 25th Anniversary week long celebration at the Preserve is Snake Eyes, complete with Timber figure. This figure is interesting as it is the only one from the first wave of 5 figures in this series which features a chase variant, namely a darker color Timber in a very few of the figure packages. I haven't been fortunate enough to stumble upon this figure yet but with wave 2 on the horizon it's likely that the varient will be an eternal quest.